Model mom and daughter duo Jerry Hall and Georgia May Jagger teamed up to promote the Invisible Zinc sun care line at famed London department store Selfridges yesterday (May 26). Georgia May clearly takes after both her famous parents - dad is Rolling Stones rocker Mick Jagger. The 18-year-old beauty was named Model of the Year at last year's British Fashion Awards. She looks like she is in pain when she tries to close her mouth. i like everything the girl is wearing. she's pretty but the teeth are distracting. Mom is still prettier than daughter, despite the age difference. That's what mixing with the fugly Jagger genes will do for ya! I like Jerry's outfit and shoes. Mick Jr. is totally unfortunate. A model? Models are getting more fugly every day. Me too. She's still only a kid. 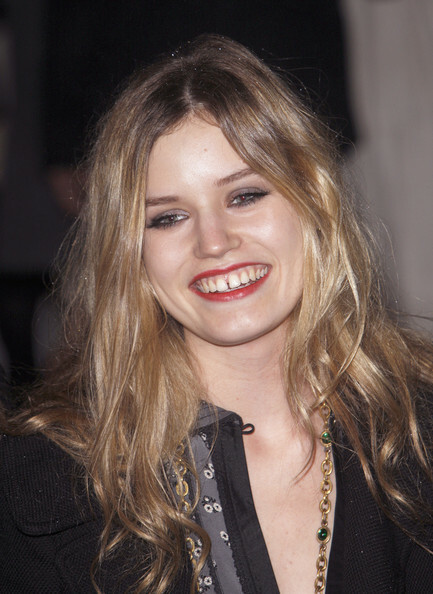 I wonder why her teeth are like this, surely her parents had enough money for braces. I've never found Jerry all that attractive, but Georgia is beautiful.